Data integrity is one of the biggest pains you’ll face as a user of Cloud SaaS business applications. We know at Nimble, you know as a consumer, and the good people at PieSync know. 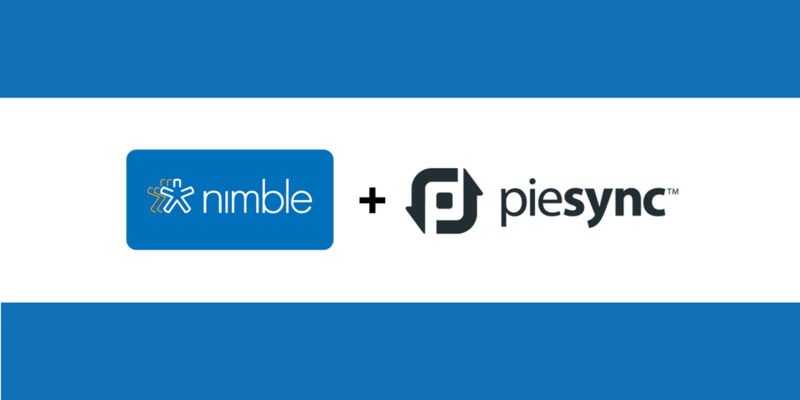 Today, we’re excited to share that we have partnered with PieSync to offer a native integration within Nimble to let you connect your Nimble contacts and data to over 130 SaaS business applications. While this sounds amazing, you might not really know where to start. The good news is that we have you covered with all the details in our webinar from Wednesday, November 29, 2017. In this webinar, Nimble CEO Jon Ferrara, Product Marketing Manager Joe Kelly, and PieSync Solutions Engineer, Frans Leys demonstrated powerful new ways to use Nimble alongside your contact management, business applications, and social networks using our newly available, in-app PieSync integration. Watch to learn the how and why of connecting Nimble with contact management, sales enablement, and marketing automation systems to enhance your team’s ability to qualify, segment, and cultivate relationships that drive business results. How to set up two-way sync with Google Contacts, turning Nimble into a robust team contact manager that tracks all your email communications. Learn how to set up Google Contacts sync. Integrating Nimble with Email Marketing Automation apps like MailChimp to help you manage the subscription status for email audiences in multiple email lists. How to sync segments of Nimble contacts into specific mailing campaigns; discover contact details for bounced emails; and assign follow-up tasks based on signups, survey responses, and average email opens or click rates. Learn to connect MailChimp. Connecting Nimble with HubSpot, Marketo, Pardot or Infusionsoft to qualify marketing leads by using lead scores, website visitor activities, and how to turn form submissions into actionable relationships. Learn how to connect with HubSpot. Using Nimble within Salesforce and Dynamics 365 to sales organizations engage more effectively with customers and prospects. How to utilize Nimble’s Social Profile Insights in these systems to reveal common interests, preferred communication channels, and missing contact details. Connecting Nimble to accounting systems like Quickbooks or Xero to make sure you can see all of your bookkeeping information without needing to re-enter data. Learn how to connect with Quickbooks Online. Previous Which Social Media Should I Use in 2018?